1846 में कैप्टेन मैडन, और धीरे धीरे दुसरे अग्रेज सरकार के अधिकारी और सैनिक – यहाँ आने लगे, जिन्होंने यहाँ कई यूरोपियन स्थापत्य कला की इमारते और भवन बनाये, जो आज भी यहाँ देखी जा सकती हैं, और फिर यह जगह अग्रेज अधिकारीयों और सैनिको का यह शहर पसंदीदा हेल्थ रिसोर्ट बन गया, जहाँ वो हर वर्ष गर्मियों में आते. दिल्ली, देहरादून, लखनऊ आदि मैदानी क्षेत्रो और देश के दुसरे राज्यों से आने वाले सैलानी – ट्रेन, बस, टैक्सी अथवा अपने निजी वाहन से हल्दवानी/ काठगोदाम होते हुए नैनीताल पहुंचते हैं। हल्दवानी से नैनीताल की दूरी लगभग 41 किलोमीटर है। कॉर्बेट और काशीपुर से आने वाले सैलानी – कालाढूंगी होते हुए भी नैनीताल पहुच सकते हैं, हल्दवानी से नैनीताल के बीच में नियमित अन्तराल में रोडवेज, प्राइवेट बस, टैक्सी आदि काठगोदाम होते हुवे निकलते रहते हैं। काठगोदाम – हल्द्वानी से जुड़ा शहर हैं, और नैनीताल से सबसे नजदीकी रेलवे स्टेशन। हल्द्वानी से काठगोदाम के बीच में कई सारे फ्यूल फिलिंग स्टेशन मिलते हैं, और सभी रोड के बाई और हैं, रानीबाग पहुचने तक आपको लगभग सीधी रोड मिलती हैं, रानीबाग मां शीतला देवी के प्रसिद्ध मंदिर और चित्रशिला घाट के लिए जाना जाता है। रानीबाग से आगे चलते हुए, पहाड़ी सड़क शुरू हो जाती हैं. शांत ताल में नौकायन, के बिना आपकी नैनीताल यात्रा जैसे अधूरी हैं, आपकी यात्रा में यह एक शानदार अनुभव जोड़ता है, आप नैनीताल की सुन्दर झील से नैनीताल शहर का आनंद ले सकते हैं जो नैनीताल को अच्छे से समझने में आपकी मदद करेगा। अन्य गतिविधियों में चाइना पीक और टिफ़ेन टॉप का ट्रेक कर सकते हैं। ट्रेक प्रेमियों द्वारा इन दो स्थानों का सबसे अधिक दौरा किया जाता है, ट्रेक करने के बाद आपको ऊंचाई से शहर का शीर्ष दृश्य मनलुभावन दृश्य दिखता है। और ट्रेक करते हुए आपको बर्ड वाचिंग, फोटोग्राफी आदि का भी आनंद ले सकते हैं. Nainital is a beautiful town situated in the state of Uttarakhand in the North. The town is situated in the amidst of mountains and is a perfect touring spot during the summers as the climate of Nainital is cold. Nainital as its name suggests, has a lake which is said to stand where the eye of Sati (Lord Shiva’s Wife) fell during Lord Shiva took a round of the universe with her dead body. 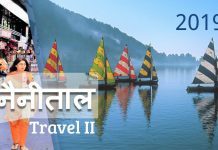 One can reach Nainital via Haldwani by taking a bus, a cab or by private transport. The distance from Haldwani to Nainital is approximately 41 kms. One can leave from Haldwani and take the straight road from the bus station that goes to Nainital. On the way one may cross Kathgodam that is a city attached to Haldwani. Here one can find three petrol stations on the left. Taking a straight route further a traveler crosses Ranibhag, that is a ghat and residence for some temples then Bhujiyaghat, where most of the buses stop for a brunch, Dolmar, Do Gaon, Jyolikoat, Baldiyakhan and the finally reach Nainital.The most loved attractions to be listed would be, first,The Mall Road, it is just a raod if we call it connecting Tallital and Mallital the two subdivisions of Nainital by a rikshaw that a person gets after standing in the queue t the rikshaw stands. The rikshaw only move from Tallital to Mallital rikshaw stand and visa versa. The Mall road has a lot of shopping centers and eating joints with a lake view straight from Tallital to Mallital.To cross the Mall road by a private car a person has to pay a toll tax of Rs 100 that is valid for one cross. One has to pay the toll every time he crosses it. The mall road is further divided into two, the upper and the lower Mall road having a one way for the cars where the lower is used to travel to Mallital and the upper is used to move towards Tallital. There is a diversion at the mall road, near the Catholic Church that is the only spot where one finds a U-Turn. Attached to this turn from the upper mall road a steep road takes its way to the Zoo, Snow View and other residential areas.This gets us to the second attraction that is The High Altitude Zoo which is stated to be the only High Altitude Zoo in the North. People fond of a trek would love to walk to the Zoo and find it amazing but for a person who is not fond of driving in the hilly areas it is suggested to take the shuttle service that is booked at the Mall road from where the steep road starts. It is a cab service that costs Rs 30 per person and performs a pick and drop for the same. The Zoo remains closed on Monday and can be explored any day from Tuesday to Sunday. The entry fee for the children up to 13 years is Rs 25, for the adults up to 60 years is Rs 50 and the entry remains free for the senior citizens as well as for the disabled people. The camera fee varies from Rs 25 for a normal camera to Rs 200 for a professional one. The parking facilities remain a big problem for the tourists during the season, one can get a parking in the National Hotel that is located in Tallital in Haldwani road, the main parking though is in Mallital flats, another parking is in the Hotel Metropole which is located at the road to the High Court and then in Sukhatal. The main parking at the Mallital Flats costs Rs 100 for a car and the costs of the Hotel Parking varies. One can also rent a bike in Nainital. Bike rides in the hilly areas are always a good option to escape from the traffic and to enjoy the actual beauty of nature. One can rent a bike by going to a bike renting shop many of which are located in Tallital, Mall raod and Mallital. The costs of the bikes vary from Rs 800 to Rs 2000 depending on the type of bike one chooses. Nainital is a hub of adventurous activities that can be performed out there such as the ropeway that takes you to the Snow view from where one can see the Himalayas and go for the rides like Bumping Cars, Flying Fox, Free Fall. Go Carting all paid separately and the tickets varying form Rs 80 to Rs 180. The other activities include Horse Riding that could be done in Snow View or at the Lover’s Point which is situated at Bara Patthar in the Kaladungi Road. A peaceful activity includes boating that will help people to explore the beautiful Naini Lake. Other activities to be listed would be a trek to China Peak and Tiffen Top. The two places are most visited by the trek lovers as they can find peace and a beautiful way throughout the trek and finally when they reach the destination, the top view of the town looks breathtaking. Many other activities include bird watching, bike rides, rock climbing etc. Nainital thus remains a peaceful yet an adventurous place, its just the way how the traveler sees it.